Acucraft’s Heat Management System is perfect for any commercial gas fireplace. What is a Heat Management System? Acucraft’s Heat Management System was developed while working with a customer who wanted to maximize the efficiency of their fireplace. It allows you to efficiently receive supplemental heat in the colder months and reduces the cost of AC during the warmer months by expelling the heat outside. Our auto-damper system is connected to your thermostat through relay which allows you to open or close the heat relief at your discretion. Our Heat Management System not only gives you full control over the heat produced by your fireplace, but it can also lower the cost of your heating & cooling. 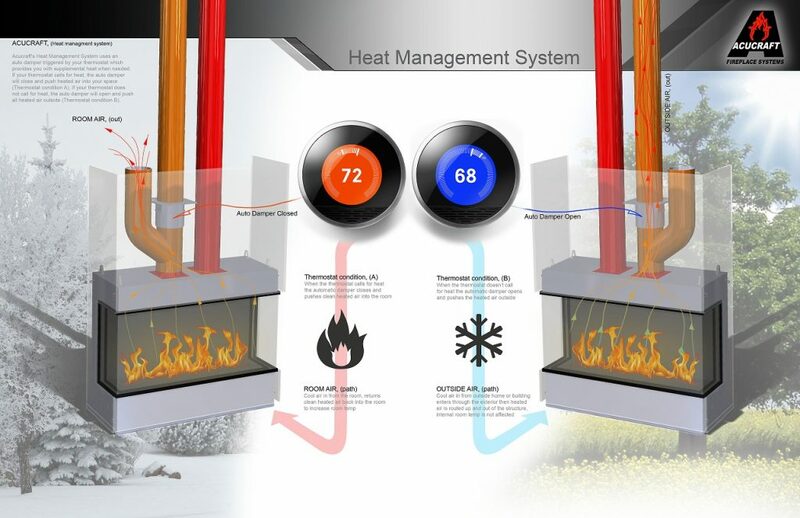 How does the Heat Management System Work? The Heat Management System works with your thermostat to determine whether heat is needed or not. Air is pulled from your space and/or outside, heated in your firebox, and either pushed into your space or outside dependent upon your current needs. Thermostat Condition A: when the thermostat calls for heat (colder weather), the automatic damper closes and pushes all of the heated air into your space providing supplemental heat. Thermostat Condition B: when the thermostat does not call for heat (warmer weather), the automatic damper opens and all of the heated air is then pushed up and outside. Want even more control over the heat supplied by your commercial gas fireplace? Acucraft’s Patent-Pending Glass Cooling System utilizes a fan below the firebox which pushes air between two panes of glass, reducing the glass temperature, and provide additional heat to your space or expel unwanted heat outside.